The New Tartars Come from the West. The new Tartars come from the west – letter to my Russian friends. Many things happen these days; and my problem is, that I know little of Russia, of Russian history and culture – and nothing of the Russian language.But during my visit to Moscow last weekend I literally „met“ the Russian Saint and hero, Ilya Muromets. 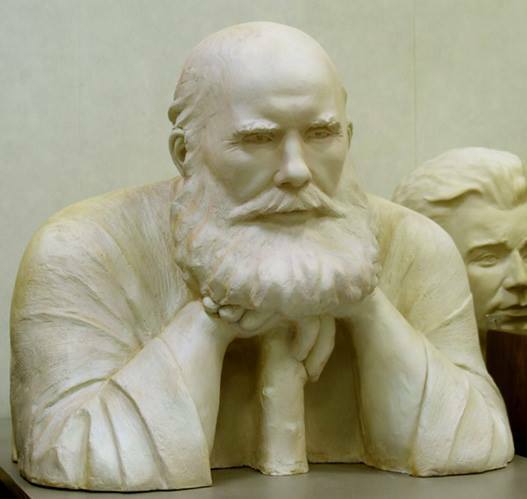 His bust of white marble was positioned in a big official meeting room – his wonderful face and its strong expression met my immediate curiosity.Back home, upon hearing about the massacres inflicted on Slavyansk, it suddenly struck my mind: Russia is being threatened by new Tartars, this time from the west, these new Tartars bear different names and complexion today – but their threat is no less dangerous.These new Tartars, like their predecessors in history, do not just stay; wherever they reach, they have come to advance further. There is no appeasement to their thrust, no cure to their aggression, no remedy against their will to conquer and rule – but one: denial of further advances. These new Tartars lie, cheat and kill – and while it is always good to talk and seek understanding, finding ways for cooperation and mutual benefit, these peaceful efforts work only, if the basic premise is never forgotten: The new Tartars from the West, they lie, cheat and kill to further their advance, no matter what. No questions asked, no respect paid, no regrets uttered – at least not sincerely: The new Tartars from the west advance towards the east – unless they are being stopped. Look around you, my friends, who can do this: stop these dangerous new Tartars? Only Russia can do that. Saint Ilya stirs in his grave, close to Kiev. Already the new Tartars have passed by Kiev, left behind them a trace of blood and corruption, they are assembling on Russia’s borders. But already long ago the new Tartars have established their advance forces within Russia proper, many of them called NGOs. And these forces have built themselves a following among Russians, well-paid and cared for, loaded with empty promises never to be kept. Promises. Russia had promised help and protection for all those who endeavored to withstand the advance of the new Tartars on Ukrainian soil. Where is that help and protection now, that the time has come to keep them? Has not Russia established a certain responsibility for all those who resisted the new Tartar vassal regime in Kiev? Will abandoning important responsibilities stop the new Tartars at all? Never, my friends, never; weakened resistance just eases their advance. A few days ago I had suggested the use of 100 cameras, to give the dead, the dying and the injured in Ukraine a voice possibly much stronger than what they enjoyed in their time of life and good health, so that their suffering may not be endured in vain. Where are the cameras, where are the results? We just receive a trickle of material and a few glimpses of what happens in Slavyansk, in Lugansk and Donezk. Thus the new Tartars do not need to fear the light of day, when they are advancing on the dead bodies of those who did not want or were unable to make their escape. Please, my friends, allow me an open word, which is meant to help, not to offend: As far as corruption in Russia is concerned, Ilya was and is no friend of it, certainly not; and even less so, when corruption amounts to foul compromise and up to treason. I am sure He did not tolerate this in His time – He will not start doing that now. Those indulging in this unhappy activity may lower their eyes to the tips of their often Tartar-made expensive shoes – and start improving their lives and activities while there’s still time. In this situation some may be suggesting a big military intervention. This will not help anybody right now, only secure further bloodshed among Tartar vassals only – and in fact reinvigorate the new Tartars’ impetus. But extend support to resistance and raise a strong media voice – these are the means of the day to thwart new Tartar ambitions. Because these new Tartars are just a shadow of their predecessors in history. The greedy new Tartar rulers are corrupt and weak. They do not enjoy wholehearted support by their own disgruntled people, they lost it through their own special mixture of greed and corruption. And once their advance is stopped and their thrust is broken – the empire of the new Tartars may implode with a foul smell.